In 1973 Assata Shakur was injured in a shootout on the New Jersey Turnpike and charged with the death of a state trooper. Alternating chapters tell the story, in her own words, of her youth and involvement with the Black Panther party, and her time in prison and multiple trials for bank robbery, kidnapping, and murder of the state trooper. A revolutionary dedicated to the liberation of Black people in America, her book focuses less on the details of her life that can be gleaned from newspapers and more on her political efforts and the unjust treatment she received in court. 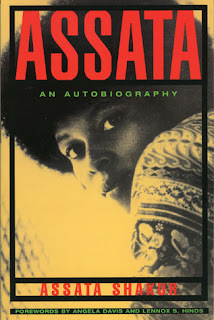 Shakur is still on the FBI's list of Most Wanted Terrorists, but that image is not the picture she paints of herself in this book. A smart young woman dedicated to racial justice, she floundered a bit in her youth, dropping out of school and learning about different social justice movements. When she found the Black Panthers, she joined them in providing free breakfast to children, a program they were famous for. She describes some of the struggles working for the group, as her ideas didn't always mesh with that of BPP leadership. But they were agreed that the U.S. had a huge problem with institutionalized racism and that it needed to be changed. It's often hard to reconcile the official view of those labeled as criminals and terrorists with the people themselves, and this case is no exception. Shakur so obviously cares about the people around her - not just her family and the daughter she gave birth to while in prison, but her larger community. It really showed when she wrote about teaching children and making breakfast for them (and she was so dedicated that it became easy for the night-owl to get up at 4:30am.) She's also very thoughtful, never just going along with what others thought, even if they were working towards the same goal. She always wanted to have conversations about the issues and look at it from different ways. She was very skeptical of the education system, and wrote a lot about the Civil War and our misunderstanding of it. She even apologizes to the people who wrote to her in prison and never received responses. The portrait she paints of herself in this book is that of a curious, conscientious, self-educated person dedicated to making the world a better place for everyone. At times I wished she had talked a bit more about why she made some of the decisions she did. For instance, she quit school but then began going to night school. Why didn't she just stay in school if she wanted to finish? It wasn't really explained, nor was it when she dropped out of college and then went back. And she definitely skipped over parts of the story, such as her sentencing for the state trooper's murder and her subsequent escape from prison. She did include a chapter about Cuba, which is where she went and presumably still lives, and I thought this chapter, which she talked about freedom and how non-racist Cuba is, was a great addendum. She makes a great point. Many great points, actually. As much as this book isn't a fun enjoyable book to read, it's a valuable perspective from someone who has endured a lot and hasn't let anything stand in her way. I'd highly recommend it to anyone interested in U.S. history or social justice. This book is on my 2018 TBR Pile Challenge and is the fifth one I've completed this year.